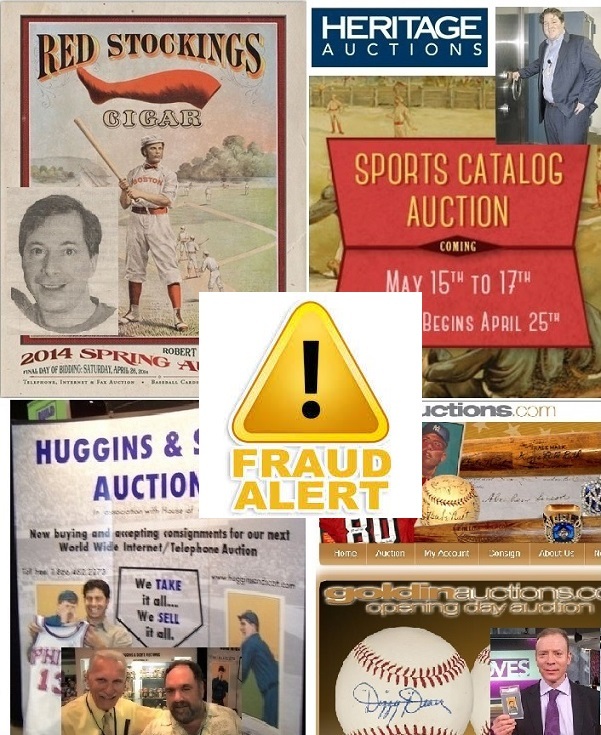 The 2014 Spring Auctions are in full swing and so is our auction fraud alert. But, as usual, there are numerous items in the Spring sales that collectors shouldn’t touch with a 10-foot pole. We devoted our last two reports to the fraudulent “Shoeless” Joe Jackson “Black Betsy” bat being offered at REA and we’re glad that the high bidder at $55,000 appears to have been able to retract his high-bid. The bat has been willfully misrepresented by REA and PSA/DNA has issued a deceptive letter of opinion stating that the bat was game used by Jackson although there is no definitive evidence to support such a claim. All Taube does in his letter is reinforce the fact that he has no solid proof to justify a determination of game use by Joe Jackson. Taube actually says, “We know that Jackson did not receive many bats throughout his career adding further weight to the probability of game use.” He says that he “knows” this despite the fact there are no Hillerich &Bradsby records to support his claim and Taube still fails to address the only surviving document detailing an actual Jackson bat order from H&B shows that he received six bats of differing weights in September of 1915. According to Taube, the determination of Jackson’s game-use is based solely on his comparing bats to the vault marked “J-13″ example that sold for close to $1 million at Heritage. He claims that the “J-13″ is unique and was not used by the other players shown swinging the same style bat in period photos. It appears that the primary basis for this opinion is that he has never examined the bats used by other players. Because Taube has never encountered them as a dealer and authenticator, he believes they did not exist. Taube’s letter further illustrates that the process and criteria he uses for determining game use of Dead-Ball era bats is fatally flawed. REA mind as well ask prospective bidders if the “Black Betsy” bat in the sale was also used by Bob Fothergill or Bill Killefer who were pictured swinging lumber that Taube claims was unique to Joe Jackson. John Taube claims that the REA Joe Jackson bat (bottom) is a unique model only used by Joe Jackson and denies photographic evidence of other MLB players like Bob Fothergill (left) and Bill Killefer (right) using the same "Black Betsy" style bat. If either of the pictured bats were 35.5 inches long, they could become Joe Jackson gamers. PSA says Goldin Auctions is selling Ted Williams' authentic last glove from 1960. But photos from 1960, like this one from July 4th (right) show Williams wearing a different glove with a different heel constriction for the lacing (see red highlights). Last week, a reader asked us to check out the auction’s claims and, as a result, we researched some photos from the 1960 season. The first image we found on the Boston Globe website pictured Williams on July 4, 1960, at Fenway Park wearing a different glove than the one appearing in the auction. The heel of the glove is visibly different than the Wilson A-2000 model that PSA/DNA authenticated as Williams’ last glove in that it features several more circular metal eyelets for the lacing and two which actually appear to the left of the seam on the thumb. The Goldin glove has no eyelets to the left of the seam on the thumb. Is it possible that Williams wore multiple gloves in 1960? Perhaps. But how could Taube and Esken know for sure its the one from his last game? Adding to the intrigue is John Updike in his famous New Yorker essay about Williams’ last game. In “Hub Bids Kid Adieu” Updike says that Williams had been giving away his bats and gloves in the weeks leading up to his final game. Goldin says the glove has “solid provenance” and was a gift from Williams to Red Sox executive John Donovan. But the auction house also says it was later passed along to another friend and has “remained in the family possession for 50 years.” It could very well be a glove Williams gave Donovan, but is it the last one he ever wore? Does PSA/DNA have actual proof to back up their claim? The Williams glove currently has a bid of $46,585. Look out for a more in-depth report on this glove coming soon. -Heritage Auction Galleries raised some eyebrows in the preview for its upcoming May auction when they posted several forgeries and non-genuine signatures of rare Hall of Famers Ed Delahanty, King Kelly, Buck Ewing, Josh Gibson and John Ward. The non-genuine Delahanty signature was at least spelled correctly and found on a 2-page letter executed in pencil from the collection of Tom Steinhardt and the Kelly signature was an amateurish forgery in pencil appearing as a signed return address on a period envelope which was executed in ink. It appears that the gurus at JSA and PSA caught these forgeries because most of them vanished from the HA website preview. Non-genuine signatures of Ed Delahanty, King Kelly, Josh Gibson and John M. Ward appeared on the HA auction preview. Which ones will appear in the actual auction catalog with JSA or PSA LOA's? The John Ward signature, however, actually made it into the Heritage catalog. The Ward letter is of particular interest in that Heritage says it comes with a “Full LOA from PSA/DNA”. The signed letter was featured last summer in our “Worst 100 Authentications” as number 46. The Ward signature is a secretarial and in no way resembles his genuine signature which is documented on numerous other documents. In fact, this exact same letter was offered in a Mastro auction in 2004 and was removed from the sale after it was reported to the auction that it was not genuine. What is most troubling about this example is that sources indicate that PSA/DNA authenticator Kevin Keating had recently attempted to sell this same non-genuine autograph to a collector for over $25,000. If that weren’t enough, the letter is also believed to have been stolen from the Baseball Hall of Fame’s Herrmann papers Archive. The fact that this letter made it into the Spring sale is a monumental embarrassment for both Heritage and PSA/DNA. PSA/DNA has authenticated a non-genuine secretarial signature of HOFer John M. Ward. The same item was removed as lot 543 from a 2004 Mastro auction. Illustrated avbove are several Ward secreterial sigs (center) found in the HOF's Herrmann papers Archive. Authentic Ward sigs from the same collection appear to the far right and have no resemblance to the Heritage signature with the PSA/DNA LOA. Another signature that appears to have made the cut at Heritage is a bogus example of 19th century boxing champ James J. Corbett which comes with a JSA LOA. Boxing expert Travis Roste tells us, “It’s signed by his wife and even says ‘Mrs. James Corbett.’ How could Heritage trust JSA on boxing?” What’s worse is that the Corbett signatures executed by his wife have been widely recognized as non-genuine in the hobby and among boxing collectors. -Heritage also has its share of questionable single-signed baseballs in its Spring auction including examples attributed to Charles Comiskey and Miller Huggins which appear to have been enhanced or gone over. Other alleged forgeries of Ty Cobb and Babe Ruth also appear in the auction. Experts say that each of these baseballs feature non genuine signatures of Hall of Famers (l to r): Charles Comiskey; Ty Cobb; Miller J. Huggins and Babe Ruth. -Robert Edward Auctions has other questionable baseballs that experts claim are not authentic. The most stunning of all is a signed Babe Ruth and Lou Gehrig ball that one top expert has opined is a forgery. That being said, JSA and Jimmy Spence authenticated the ball and it is now being touted as one of the premier lots in the auction with a current bid of $35,000. According to one expert we spoke with: “It lacks the fluid handwriting of Ruth and Gehrig on both autographs. It was just signed too slow and its my opinion it is not genuine.” REA is no stranger to offering fake Babe Ruth material as evidenced last year when they removed nearly a dozen signed photos that experts deemed forgeries while they ignored expert Ron Keurajian’s opinion and sold another non-genuine Ruth signature on a photo inscribed to actor Gary Cooper. Several experts are of the opinion that this 1927 Yankee ball being offered by SCP is not genuine. -Sports Cards Plus Auctions (SCP) recently got their Spring auction preview up online and the most troubling item pointed out by readers was another one of the green ink 1927 New York Yankee balls featuring what are believed to be forgeries of Ruth, Gehrig and some of their Yankee teammates. Experts we spoke with noted that the pen pressure is oddly uniform and that the ball resembles the similarly suspect 1927 ball sold for over $300,000 at Heritage in 2013. Legendary sold a forged Ty Cobb single signed ball in Feb. (left); REA is selling alleged fakes on a 1910 Tiger team ball (center) and a 1955 single (right). Ugly also describes an alleged single-signed Dizzy Dean ball touted by Ken Goldin at Goldin Auctions as the “Nicest One on Earth.” The ball, which is featured as a premier lot in the auction with a current bid over $16,000, comes with an LOA from PSA/DNA dated January 31, 2014. Its described by Goldin as “One of the most difficult single signed Hall of Fame baseballs to obtain on the sweet spot” since Dean was known to sign almost exclusively on the side panels of baseballs. This ball illustrates just how tough it is to determine whether a single signed baseball is authentic. Upon review, the signature lacks the fluidity of Dean’s autograph and was signed in a slow and laborious hand. Experts we spoke with said they would not be able to certify the ball as genuine. The signature appears unfaded and is signed on a gem-mint ONL ball with the original box. The ball has all the tell-tale signs that should raise red flags for any authenticator and clearly contrasts the single-signed example illustrated on the PSA “Autograph Facts” page for Dean exemplars. When we asked Ken Goldin about the ball he noted that the ball was sold for over $20,000 this past January by Lelands (without a PSA LOA) as part of the “Red” Schoendienst Collection. Did Steve Grad & Co. write the letter for this ball based upon its merits as a Dean signature or because of its provenance? How many other experts would certify this one genuine without that provenance? Another Dean single-signed ball that has been questioned in regards to its authenticity appears in the SCP Auctions preview with an “auction LOA” issued by PSA/DNA. None of the experts we spoke with would definitively opine that that ball is genuine. We are assuming that “Red” isn’t forging Dizzy Dean balls and that the Goldin ball is authentic but it is not representative of Dean’s handwriting. We include an image of both balls for our readers to decide for themselves. 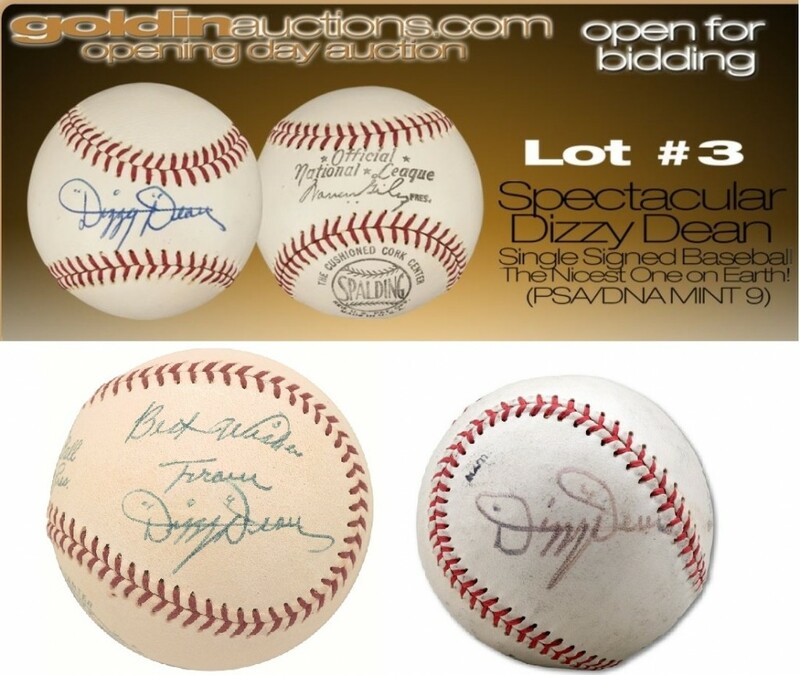 Experts have questioned the authenticity of Dizzy Dean balls in Goldin Auctions (top) and SCP (bottom right). They come with a PSA/DNA LOA and the Goldin ball originated from the Red Schoendienst Collection. The Dean ball on the bottom left corner appears on the PSA "Autograph Facts" page as a genuine Dean exemplar. Neither REA or Muchinsky have amended the lot description to reflect that there is no chance this item was manufactured as a pinback. 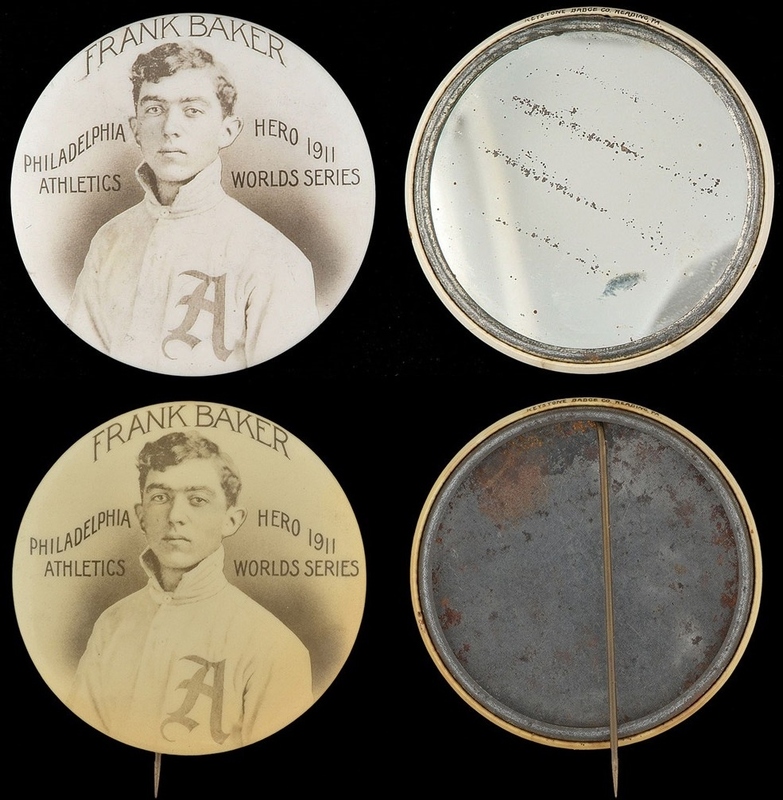 The 1911 Frank "Home Run" Baker celluloid pocket mirrors (top) are well known in the hobby, but REA is trying to pass off a broken mirror with a pin replacement (bottom) backing as a newly discovered rarity. 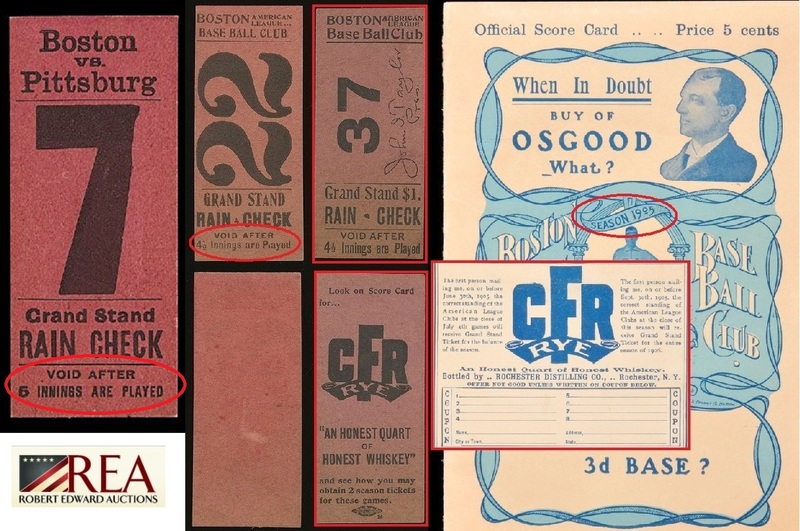 -David Maus, a noted ticket expert and collector, pointed out another misrepresentation on two tickets REA alleges are 1903 and 1904 Boston Americans tickets (lot 1085). REA and Lifson advertise the alleged 1904 ticket as an opportunity for collectors to have a 1904 ticket for a run of World Series tickets, being as there was no Series played in ‘04 and Boston won the AL Pennant. In the case of the alleged 1903 ticket, REA says its a chance for collectors who can’t afford a rare and expensive 1903 WS ticket, to acquire a much cheaper alternative. What REA fails to mention is that the 1904 ticket is actually from 1905 as evidenced by the Rye Whiskey contest on its reverse which is featured in the team’s 1905 season score cards. The 1903 ticket is actually from 1904 as evidenced by the rain check disclaimer which states, “Void after 4 1/2 Innings” which conflicts with the “5 Innings” inclusion on a genuine 1903 WS ticket. A 1903 WS ticket proves that REA's alleged 1903 ticket is from 1904 (left). A 1905 Boston score card includes a contest featured on the back of REA's alleged 1904 ticket, thus making it from 1905. -David Maus also identified another ticket REA is selling as an original NY Giant game ticket from May 28, 1951, the day Willie Mays hit his first Home Run at the Polo Grounds. But Maus says the ticket is actually a proof ticket with no section or box indicated. REA listed another proof ticket for a ticket they claimed was from Bobby Thompson’s “Shot Heard Round the World” game, but that was also only a proof-ticket. REA has since added an addendum on that lot, noting the ticket was never used by or sold to fans. REA is selling two New York Giant tickets from historic games at the Polo Grounds, but they are only proof tickets never intended for use. The tickets are missing the numbers denoting the section or seats. -Dave Grob, already pointed out in the comments section of our Black Betsy bat report that REA also misrepresented several Brooklyn Dodger satin jerseys as special “one year” uniform introductions when they were actually used for several seasons. Grob told Hauls of Shame readers, “Rather a shame that such little care and attention was given to some of the uniform items in this auction as well” and added sarcastically, “I suspect it would have all but been impossible to find this information since if (you) go to Google and type in a search for “Brooklyn Dodgers White Satin Home Uniforms,” this article is only the #3 reference you would have been pointed to.” Grob was referring to his own article on the subject published on the MEARS website which illustrated that the Dodgers wore satin uniforms in 1944, 1945, 1946, 1949 and 1950. Grob’s article was published in 2008 and specifically addressed the fact that the Baseball Hall of Fame’s “Dressed to the Nines” uniform database was not accurate in regard to the Dodgers’ game use of satin uniforms. REA called its 1948 Carl Furillo satin jersey a "rare one-year style" but Dave Grob pointed out the Dodgers wore them in several other seasons including 1949. -REA has also facilitated the return of yet another ghost-signed copy of Christy Mathewson’s Won in the Ninth book. Armed with a 1911 letter sold by Hunt Auctions, REA and JSA claim the letter and the bookplates were signed by the same hand. Unfortunately for REA the majority of autograph aficionados seem to agree with Ron Keurajian’s assessment in his book, Baseball Hall of Fame Autographs: A Reference Guide, that all of the books were secretarial signed. The recent sale prices of the books tend to show that these secretarial examples are losing value since the record-high sales at Heritage for $20,315 in 2012 and $16,590 at Legendary in 2010. The last copy that sold at REA went for $7,702 in 2013. The bid on the copy in REA’s current sale is $4,750. The secretarial Mathewson signature on the REA bookplate contrasts the authentic signature found on a previous 1912 Mathewson book signed by Matty. A signature found on a copy of a 1911 letter sold by Hunt Auctions is offered by REA with the lot as evidence the Won in the Ninth copies are genuine. -Huggins & Scott has had lots of items stolen from the NYPL and the Baseball Hall of Fame appear in previous sales and another one showed up in their Spring auction. 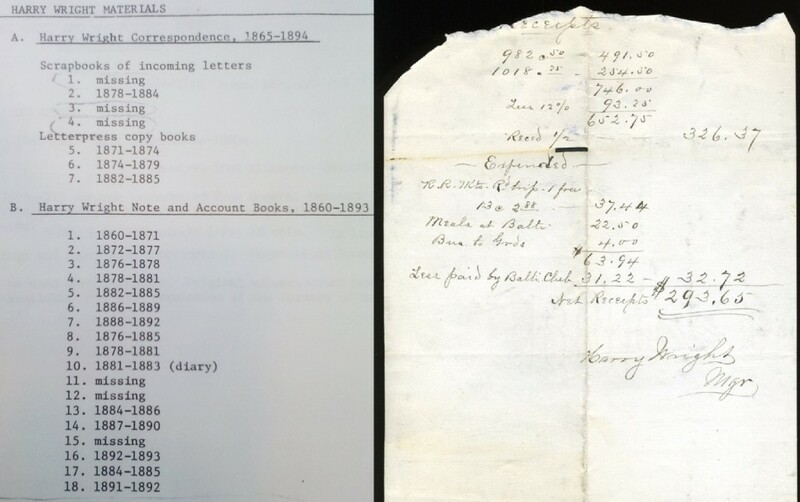 The auction house sold an 1892 ledger page signed by Harry Wright which was ripped from one of the NYPL’s Wright Correspondence or Account Book volumes. The page was auctioned-off for only $1,700 and it was the same document that was sold last year at Premier Auctions for $2,244. It appears to be a “hobby hot-potato” losing its value. If it were legitimate, the Wright document would command a sale price exceeding $5,000. The signed Harry Wright document sold at Huggins & Scott originated from the NYPL's famous Spalding Baseball Collection. A page from the NYPL inventory appears to the left. -Heritage Auction Galleries has yet another item believed to have been stolen from The Hall of Fame’s August Herrmann Papers Collection which includes the files for the National League’s protested games from 1902 to 1926. The Heritage offering is a 1924 letter written to NL President John Heydler by Pirate owner and HOFer Barney Dreyfus in regard to a protested game played against Philadelphia. 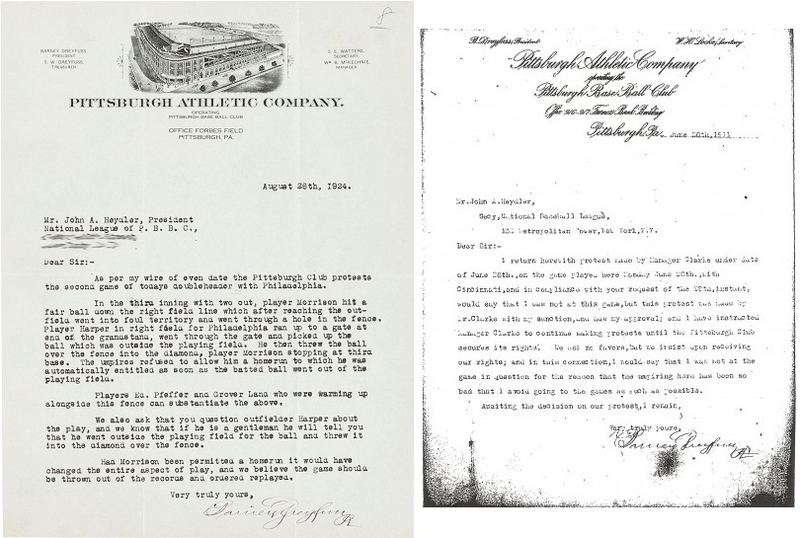 The Heritage letter written by Barney Dreyfus to John Heydler in 1924 (left) was once part of the HOF file that still includes many other Dreyfus letters to NL Presidents (including Heydler) in regard to protested games (right). REA is selling three handwritten letters by Roy Campanella in 1946. Sources indicate that the letters were swiped from the Dodger team files in Los Angeles. For each letter, REA says that “the historical significance of this letter cannot be overstated” and the auction house points to a 2013 sale of a similar letter by Heritage Auction Galleries. That letter, addressed to Branch Rickey, included a scouting report on Larry Doby and sold for $23,900. How such historic documents made their way into the the REA and Heritage sales is not addressed by either auction house. The Library of Congress is in possession of the Branch Rickey Papers, but that collection does not include Rickey’s files from the Brooklyn Dodgers which remain part of the Dodger archive maintained in Los Angeles by the current ballclub. Sources indicate that a file of Campanella letters addressed to Rickey and his employees including Harold Parrott, Robert Finch and Al Campanis were wrongfully removed from the Dodger team files in the 1980’s. Stay tuned for in-depth coverage of the dubious Campanella letters in an upcoming report. REA claims to be selling Pistol Pete Maravich's 1974 "game used" warm up (left) with a MEARS LOA. In 2007 MEARS wrote an LOA for a different warm up as being from the same year (center). REA fails to mention that their lot was found in a thrift shop and there is no evidence to support claims of Maravich game use. In addition photos from the 1974 season (inset) show that the Jazz wore different warm ups. Maravich only wore #44 in 1974 (right). Last but not least, we venture back into the jungle that is known as “game-used” uniforms and equipment and REA’s current offering of an alleged 1974 “game-used” warm up jacket supposedly worn by none other than “Pistol Pete” Maravich. Not only is there no supporting evidence showing Maravich ever wore such a warm up in 1974, 1975 or any other year for that matter, but REA conveniently fails to mention the rock-solid provenance of the garment, having been sold on eBay in 2010 as a “find” in a thrift store. What’s worse is that authentication company MEARS and Troy Kinunen purchased the item at the time after it was pulled from eBay for $4,000 and then proceeded to authenticate the item as game used with no evidence—despite being aware of conflicting info from another warm up they had authenticated previously. In addition, AP photos and NBA game footage from 1974 were posted online where the fraud was disputed at GameUsedUniverse.com in a discussion titled MEARS Mumbo Jumbo. REA, however, makes no mention whatsoever of the controversy and the conflicting information feeling comfortable in selling the warm-up as “game used” with its MEARS LOA. And even though several photos showing the 1974 warm ups have since been published, REA now adds, “MEARS states that it was unable to find a photo of any New Orleans Jazz player wearing a warm-up jacket during the 1974 season.” After MEARS purchased the warm up in 2010 for $4,000 they turned around and then valued it at $20,000. REA lists the estimated value now as “$2,500+” and the garment has a current bid of $1,200. Step right up to REA and get some “Pistol Pete” or “Shoeless Joe.” Mumbo-Jumbo indeed. REA identifies several T-206 PSA-8 graded cards (above) as being trimmed. Recently it was revealed in the Mastro case that veteran dealer Lew Lipset wrote a letter to the presiding Judge alluding to the past history of Mastro and Rob Lifson as card doctors (see excerpt inset). On a final note, REA identifies several PSA-8 graded T-206 cards in its current sale as being trimmed. REA’s Rob Lifson states in several listings for cards including those of Addie Joss and Hugh Jennings, “In our opinion, this card has a very slight trim along the top border, though someone else may have a different opinion.” Lifson’s opinion and disclosure to bidders is interesting considering a recent letter sent to Judge Ronald Guzman in the Mastro case by veteran dealer Lew Lipset. The letter was recently made public in Federal Court and in the letter Lipset describes Mastro as “dispicable” and as a known trimmer of cards. Lipset also mentions Lifson, alluding to the REA President’s own past as an alleged card trimmer with his old partner, Bill Mastro. In the letter Lipset recalled a time when Mastro was viewing cards at a dealer table in the 1980’s. Lipset recalled Mastro telling the dealer, “…these look a little short (i.e. trimmed), did you get them from me or Robert (Lifson)?” Lipset added for the Judge, “Bill’s tendency to trim cards was widely known throughout the hobby.” In interviews with Lipset for our upcoming book, The Madoff of Memorabilia, he also stated that Lifson’s trimming of cards was also well known throughout the hobby. It is just a never ending battle of forgeries and John Q just keeps shelling out his $, s for worthless junk.I find it amazing how these so called reputable dealers chastise Halls Of Shame, but then change their tune on what they are trying to pawn off as real,when like we use to say,THEIR “CRAP” IS PUT IN THE STREET,y”all get my drift. Once again, amazing when pictures of autographed balls with certs are posted side-by-side. Look at the Dean ball at the top, and the bottom left: once again, they aren’t even close – the autographs don’t look anything like each other. How can anyone think these were signed by the same person? Not a single letter looks the same between the signatures. Judging from the trademark, these balls would have been signed around the same time, too. I bet this ball shows up an an auction with a deceased-HOF autograph on it shortly. Looks like the Dean ball sold for $25K and the alleged Ted Williams glove went for $88k. Some results from the REA sale: REA’s alleged Joe Jackson bat only had 2 bids and sold for $55,000; The Matty Won in the Ninth went for just $7,000; the misrepresented Home Run Baker broken pocket mirror went for $1,100; and the bogus Pistol Pete Maravich Jazz warm up went for $3,000. You have to understand the incestuous nature of the “hobby”…the blatant conflicts of interest. The “experts” have to protect not only their big ticket clients, but the other so-called “experts.” One so called “expert” often claims he “buries” a bat(sometimes with a suspect story)in someone’s collection hoping it never resurfaces anytime soon, but when it does they have to make sure it gets promoted(even with tortured logic) and sold hopefully at least what the previous “whale” paid for it. It keeps the train running smoothly and the money in the hobby. Just follow the money trail on the Jackson bat that recently sold. Check out who own it prior to 2004 and who benefitted…dealer, auctioneers(28-30% commission) and client who gets payment and moves on to buy something else from the same people. Continuous transactions makes money. A lot of product gets moved though a small group of people. I could go on & on…but I digress for now.